This past spring Cardinal Roger Mahony, Archbishop of Los Angeles, dedicated the centerpiece of the campus of Thomas Aquinas College in Santa Paula, California. Designed by Duncan Stroik, a professor at the University of Notre Dame School of Architecture, the chapel draws its inspiration from the churches of Italian Renaissance architect Brunelleschi – designer of Florence's famous dome – from the Venetian churches of Palladio, and from the tradition of Spanish Mission churches of California. While drawing inspiration from a variety of sources, the chapel is a copy of no church, but a synthesis of all of them in a truly new work of art. 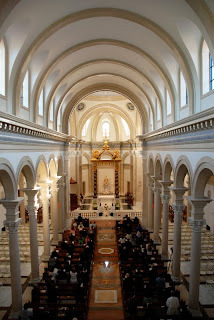 The Chapel cost $23 million to construct and seats 375, but is large enough to hold the entire student body of 500 during important festivals in temporary seating. Twenty solid marble columns grace the nave and a bronze baldachino modeled on the centerpiece of St. Peter's Basilica surmounts the altar. To view more work by the architect, please click here.